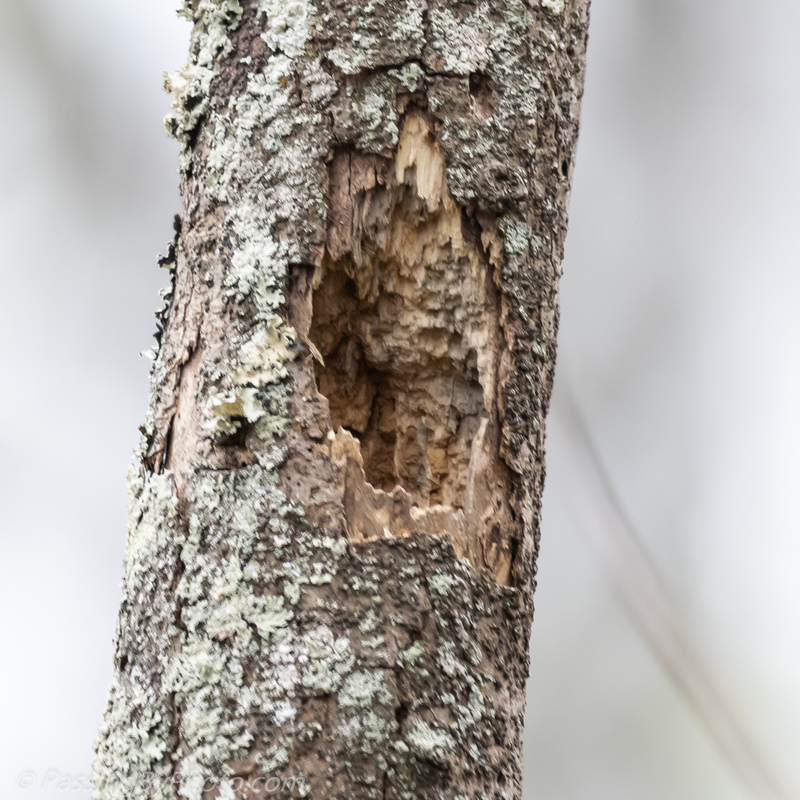 A few days after seeing a Yellow-bellied Sapsucker investigate a tree cavity I saw a Chickadee do it. 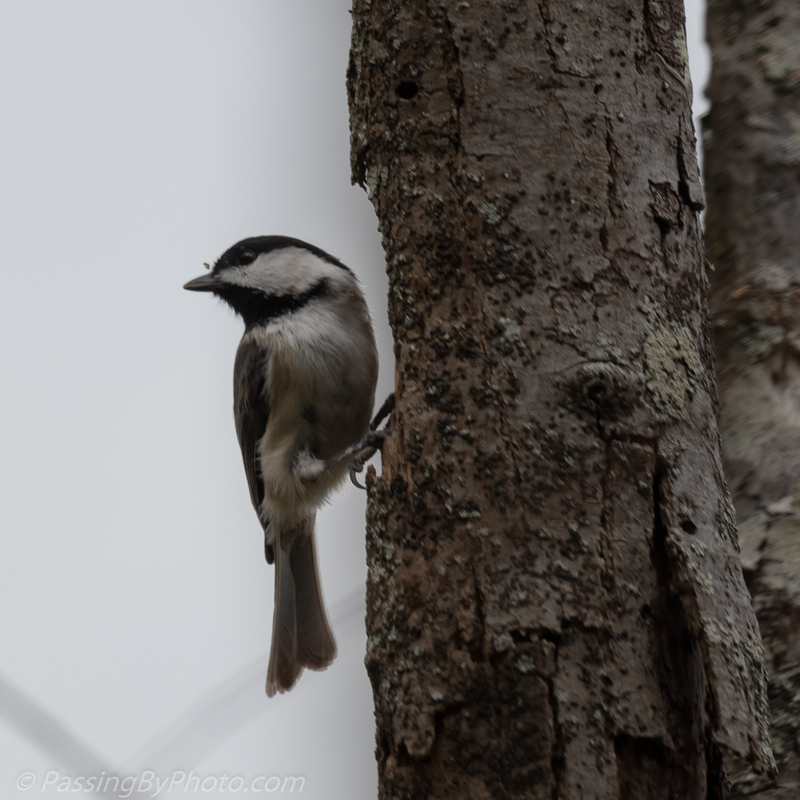 It wasn’t as nice a day with a grey sky for a background, but the bird’s behavior was interesting. 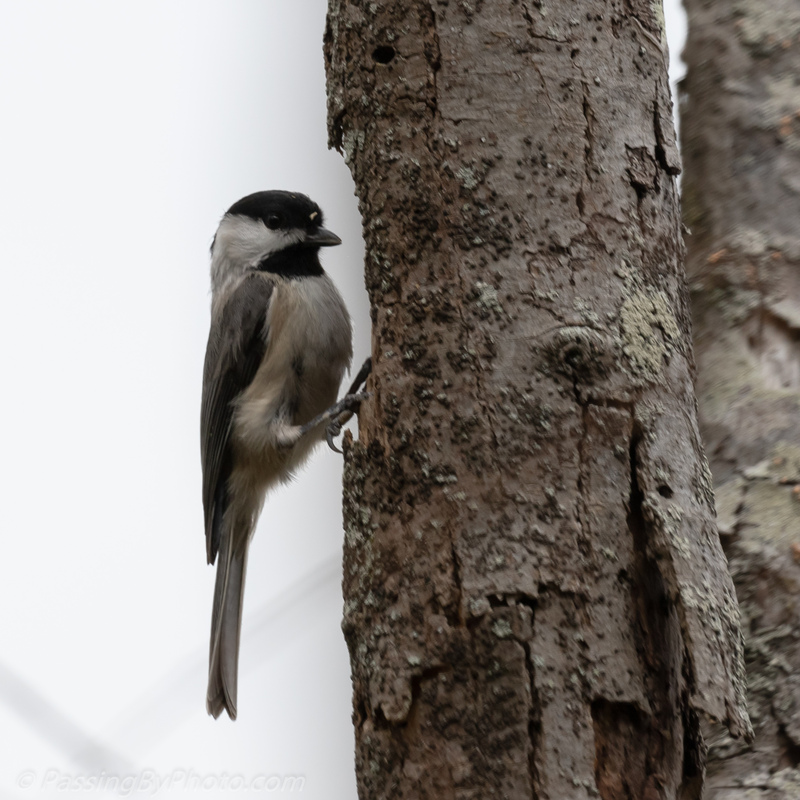 The Chickadee went back and forth between this tree, which is dead, and an overhanging branch across the path. 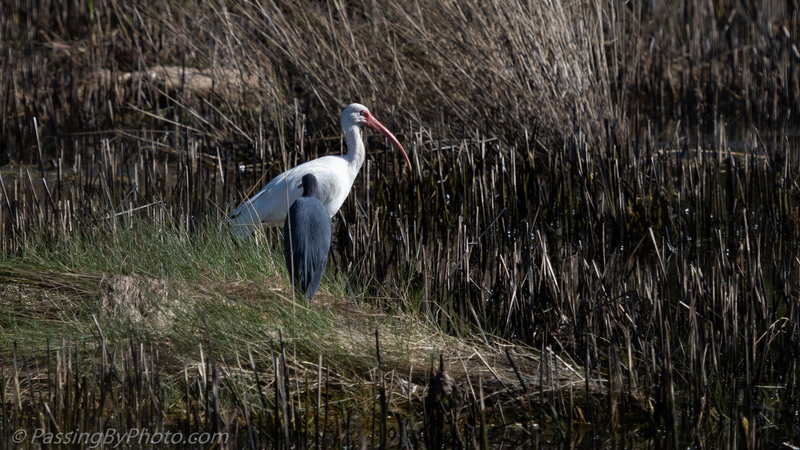 I’m not sure if he was looking for food or a potential nest site. 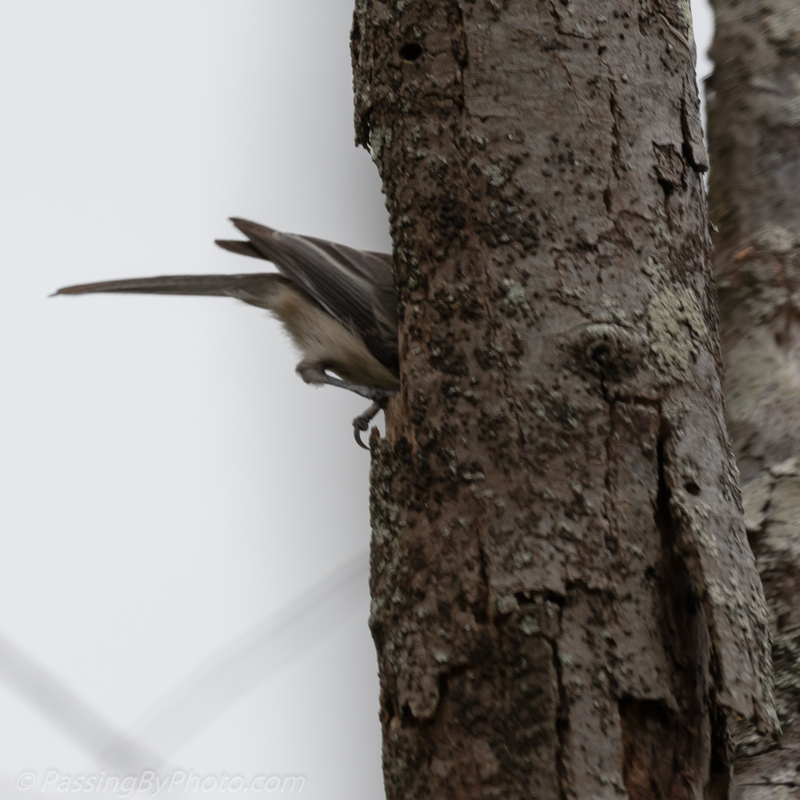 After the Chickadee flew off I went around the tree to see the cavity. 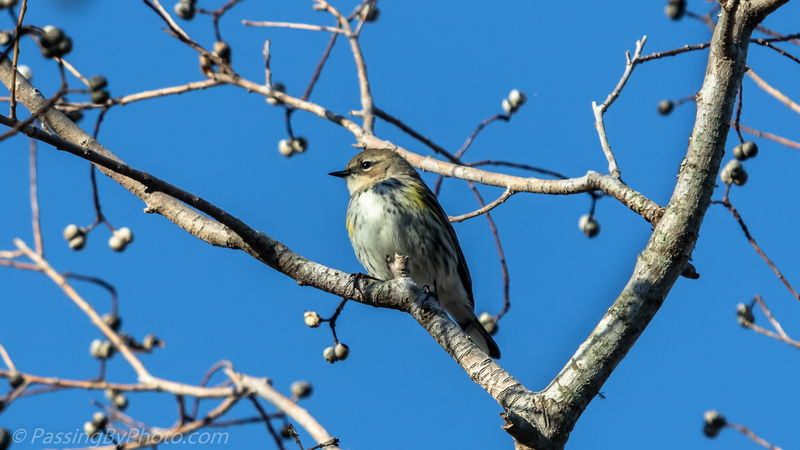 I’ll be watching this spot when I pass by as spring progresses. 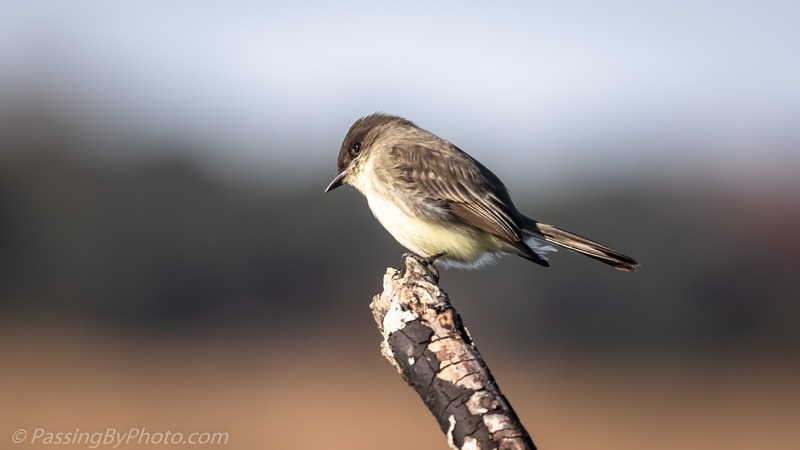 The Eastern Phoebes around the rice field canals often eat by alternating flying out over the canal to gather insects and landing on a perch that overhangs the water. 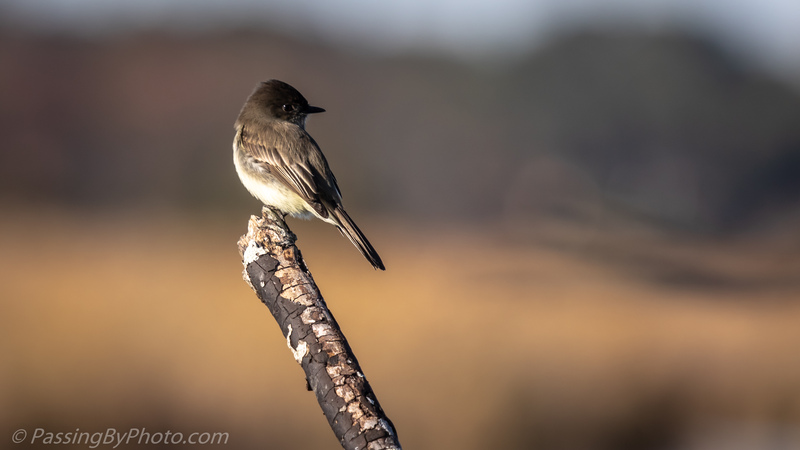 The marsh reeds appeared golden at the end of the afternoon on this day and I was able to get a bit better background as I got closer to this Phoebe. 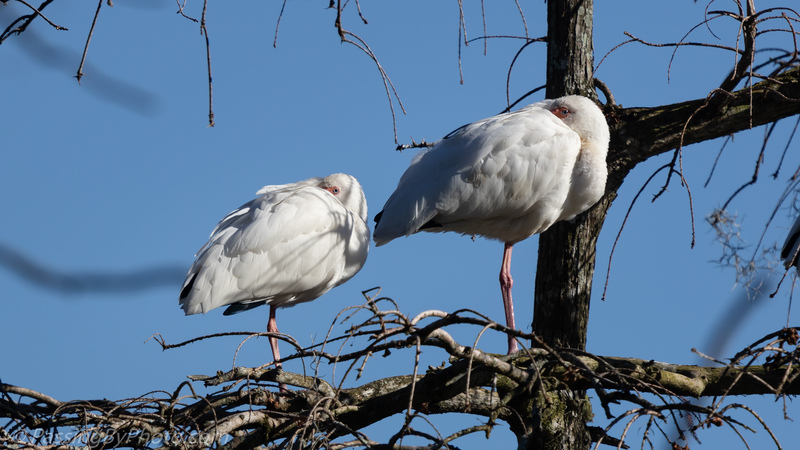 Not surprisingly, many of their chosen perches are obstructed from view by branches and reeds. And they don’t hold still very long. 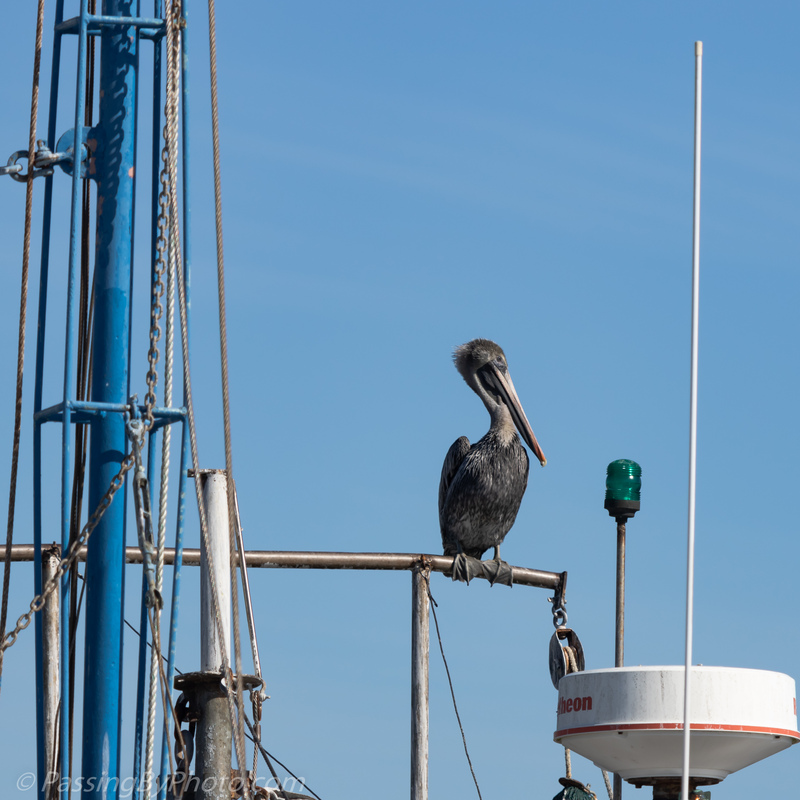 Brown Pelicans will land on almost anything around the dock, including this shrimp boat rigging, and somehow their feet adapt. This one is looking down into the creek, alert for any chances at lunch. 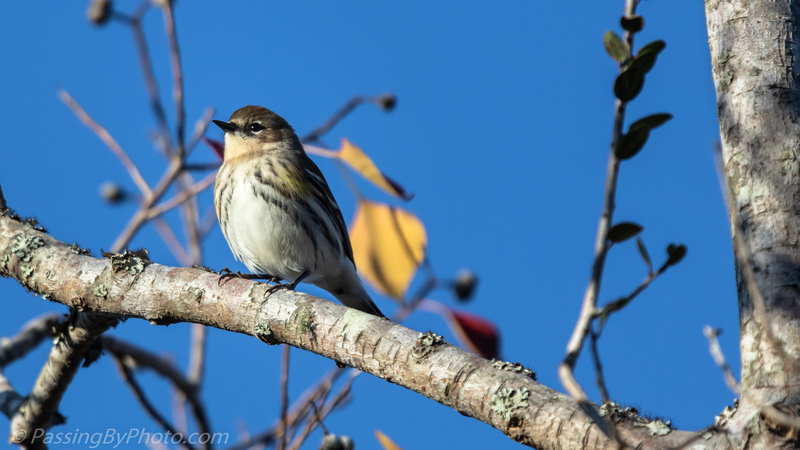 The sky was gloriously blue and this Yellow-rumped Warbler flitted in and out of the trees along the rice field dike. 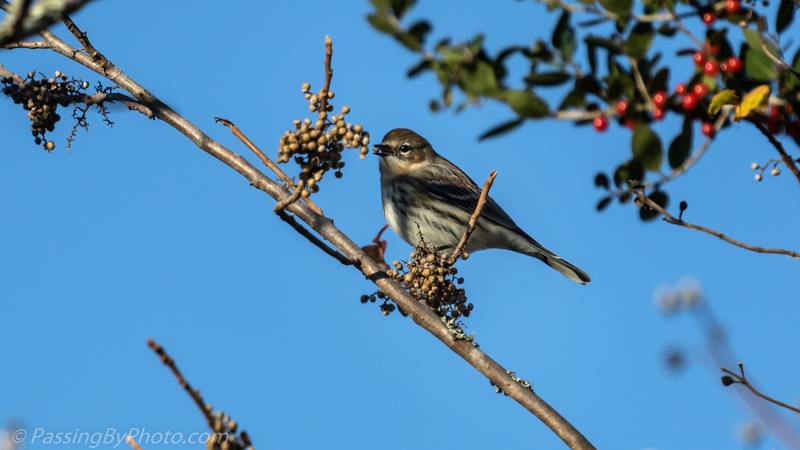 Anyone who follows birds, especially the small ones, knows the advantage of fall and leafless trees. 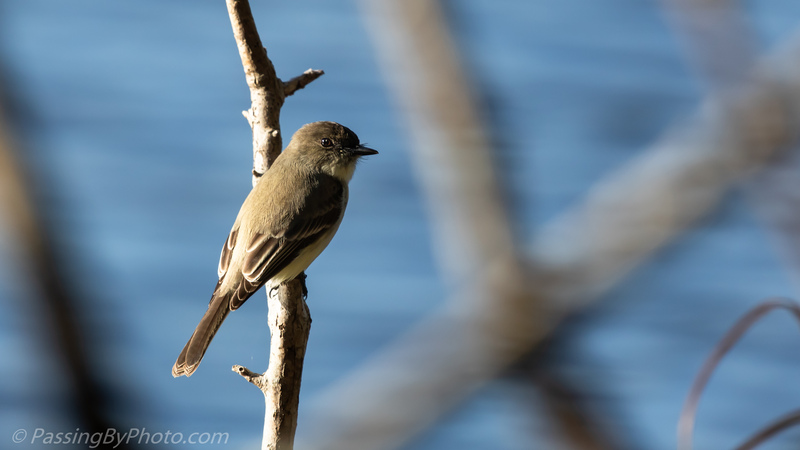 The other edge of the dike is lined with various evergreen trees making it easy for these little fellows to disappear in a flash. 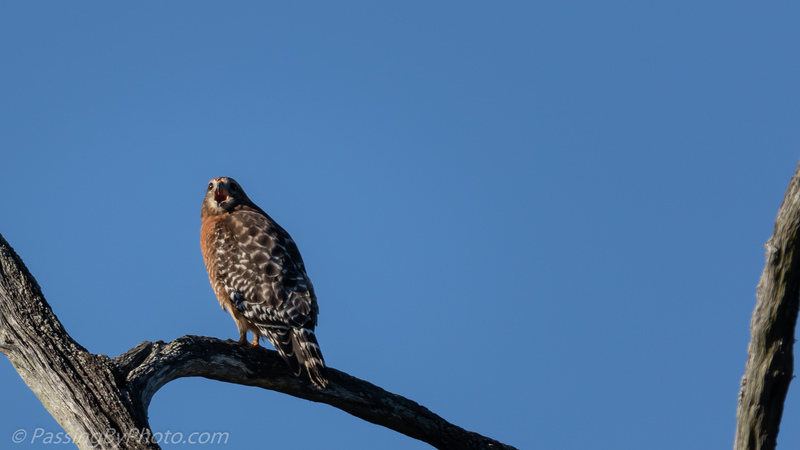 There are a number of Red-shouldered Hawks around the swamps I frequent. 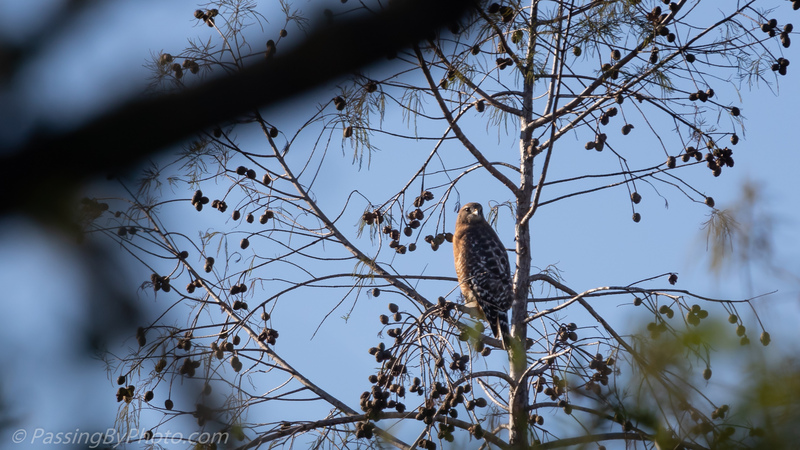 I often hear them call, and this day I finally spotted one on an open branch. 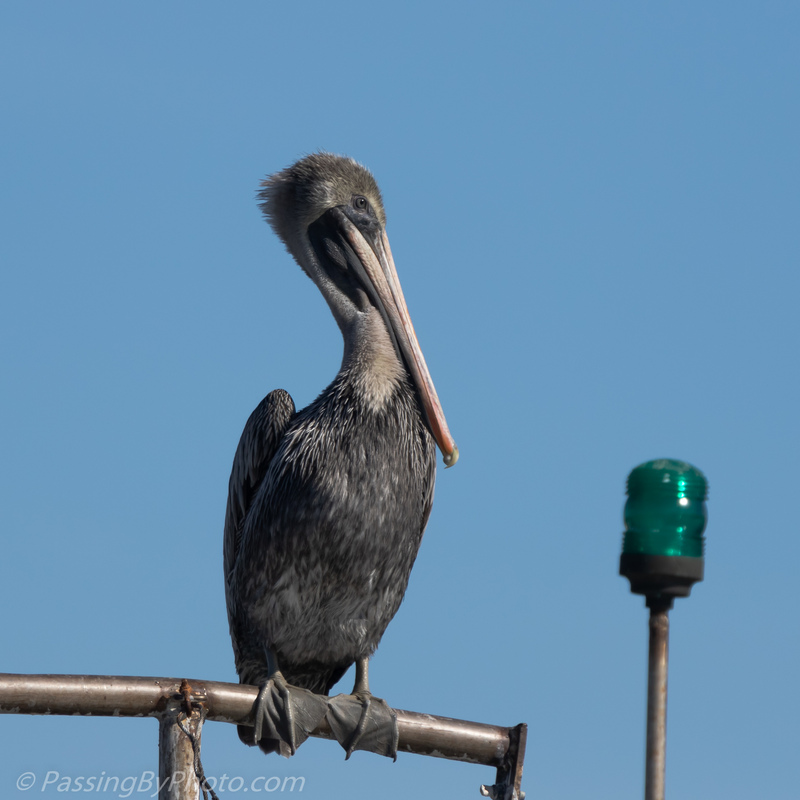 I thought he was about to fly after displaying the rousing behavior. Instead he settled in and called some more. 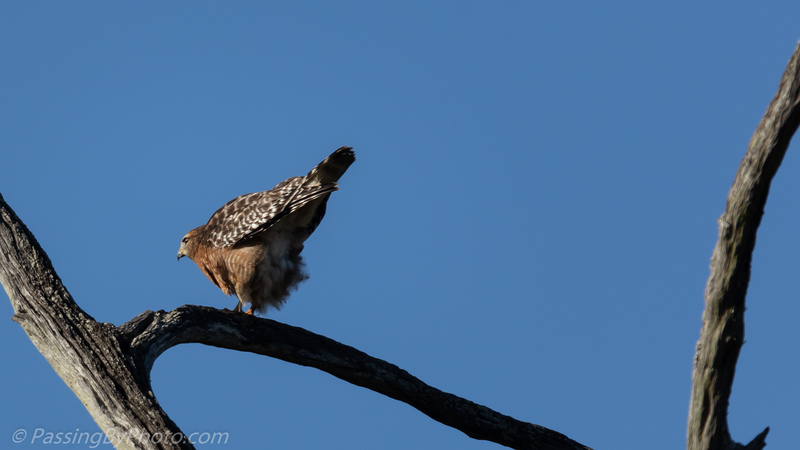 I’ve observed Red-shouldered Hawks make a lot of noise like this before when they appear to be hunting, as contrary as it seems. All potential prey should be driven into hiding. 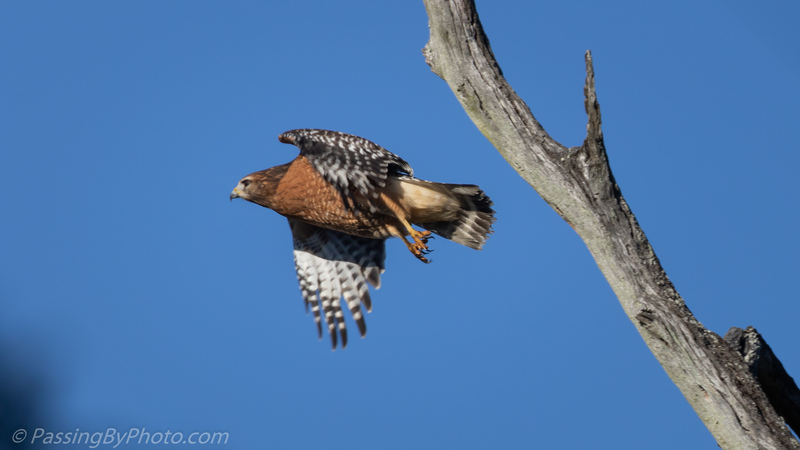 I moved to a vantage point on a perpendicular trail just in time to see him fly off. He didn’t go far and continued his calling. 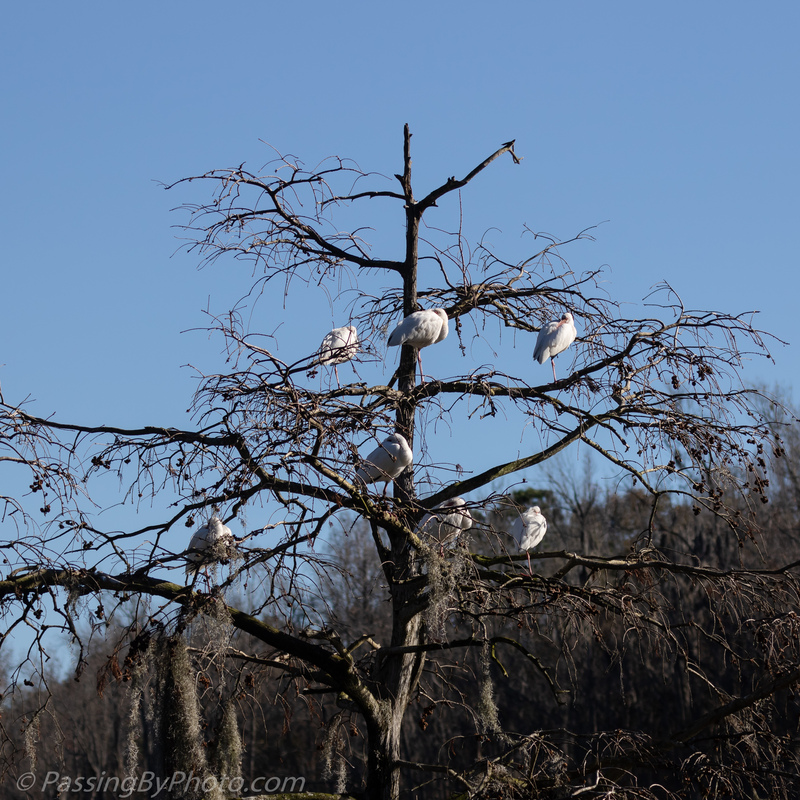 These images were taken in a section of the wildlife management area that I don’t visit often. Until recently you had to climb over fallen trees to get there and the dike is lower, which puts the photographer closer to the water which is good and bad. Getting a lower prospective and Alligator reflection is good. 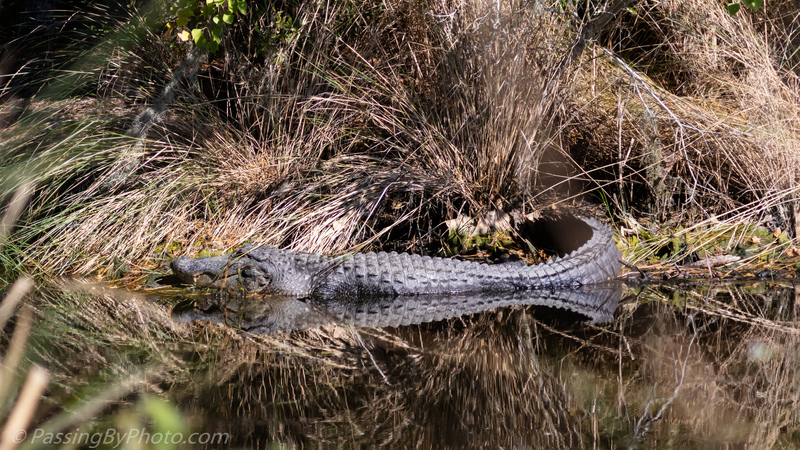 Being closer to unseen Alligators can scare the &#!% out of a photographer if they move! Being lower also means less breeze, which much of the year means more mosquitoes. Last week was cooler so there wasn’t much insect activity. 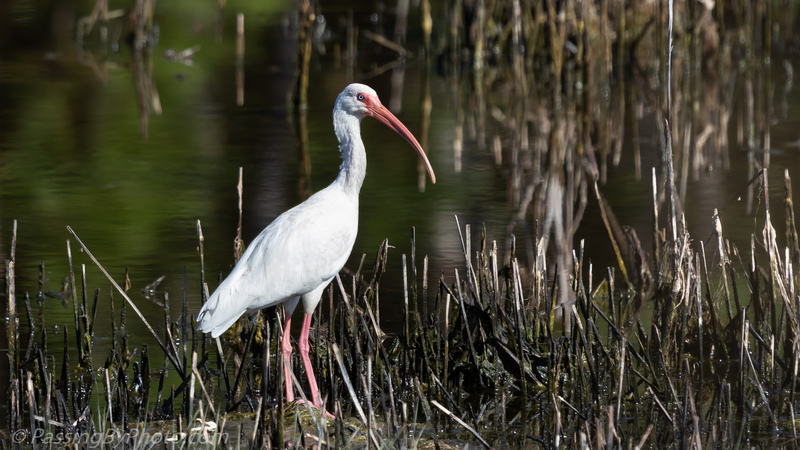 This White Ibis was enjoying the sun and along came a Little Blue Heron. 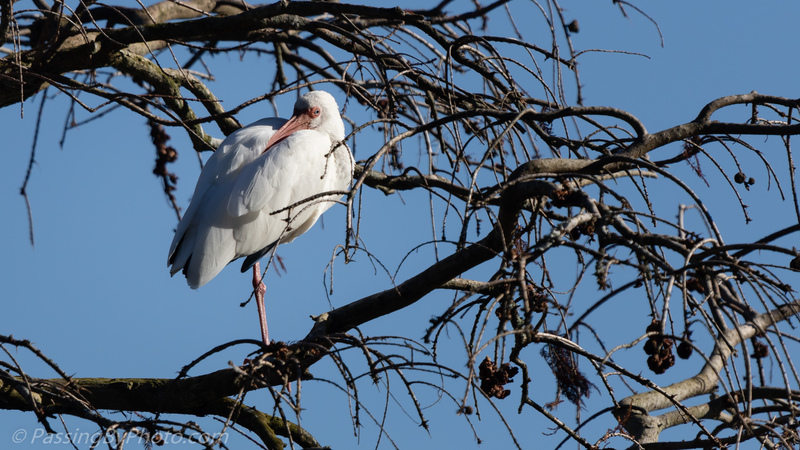 The Little Blue Heron slowly encroached on the Ibis’ space. 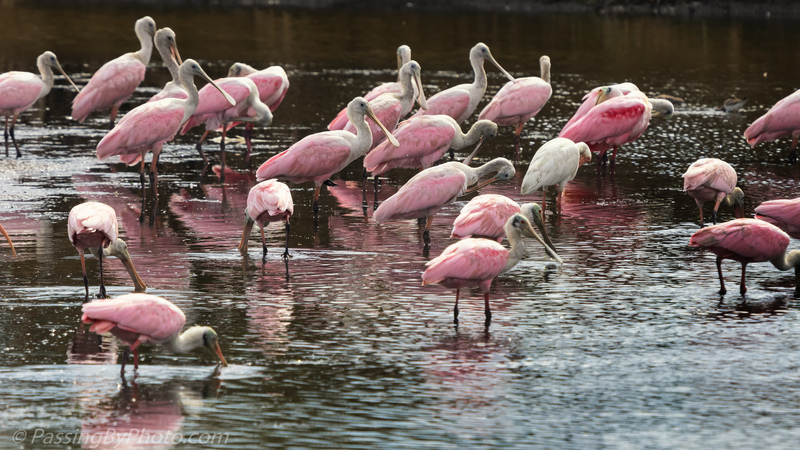 This is a broader view of one of the places I found Roseate Spoonbills feeding in October. 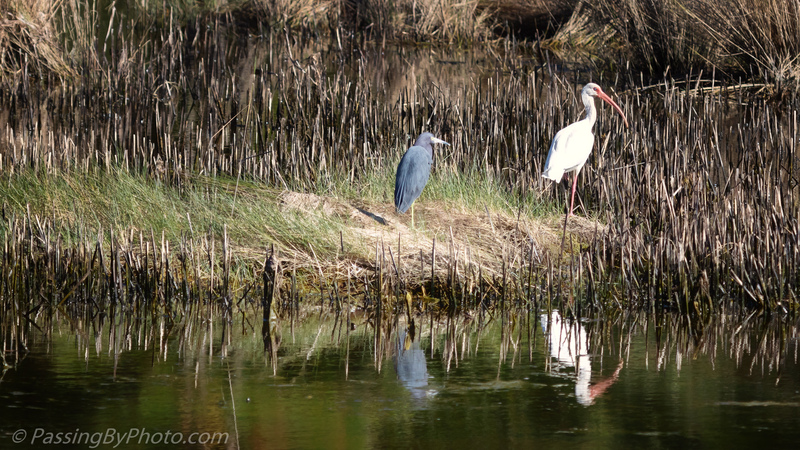 The tall marsh reeds are intact behind them, hiding that there is a narrow road on the dike there, and another pond beyond that. 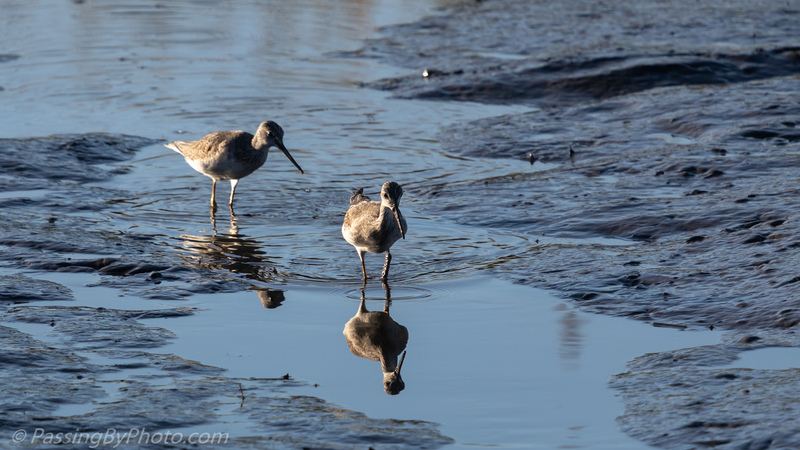 Even the tallest photographers I know can’t see over those reeds and in some spots they are two feet thick. 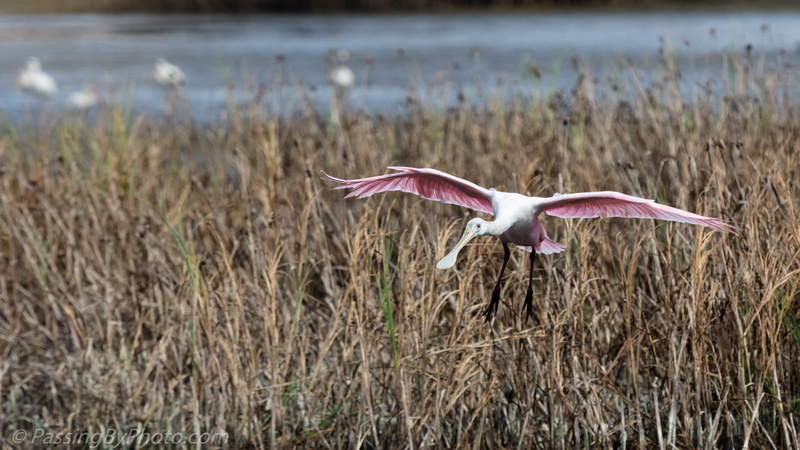 These Roseate Spoonbill images were taken from a dike that runs perpendicular to that main dike. 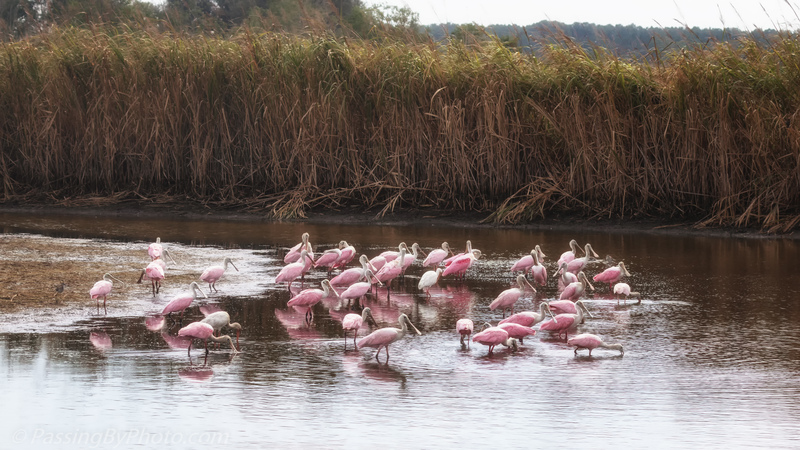 I was standing where the reeds were less dense and some had been flattened by alligators climbing through them and wind and rain beating them down. 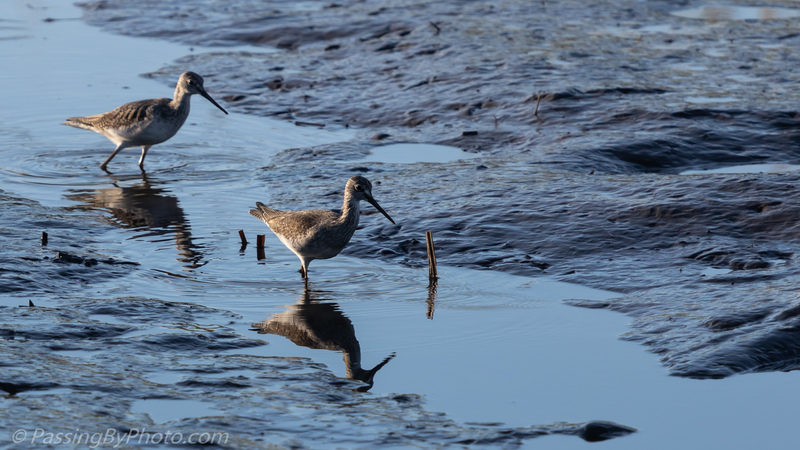 As these birds were feeding the flock was constantly changing with one or two coming or going looking for “greener grass”. 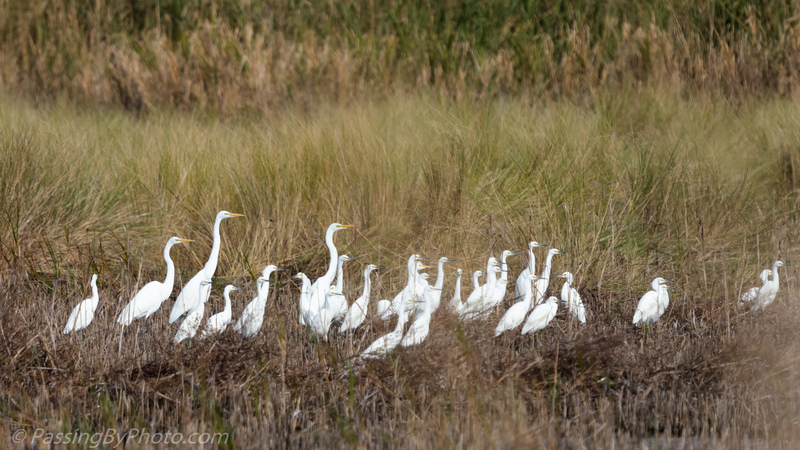 As I was maneuvering to a spot where I could view the wading bird feeding frenzy I spotted this small group of egrets off to the side. 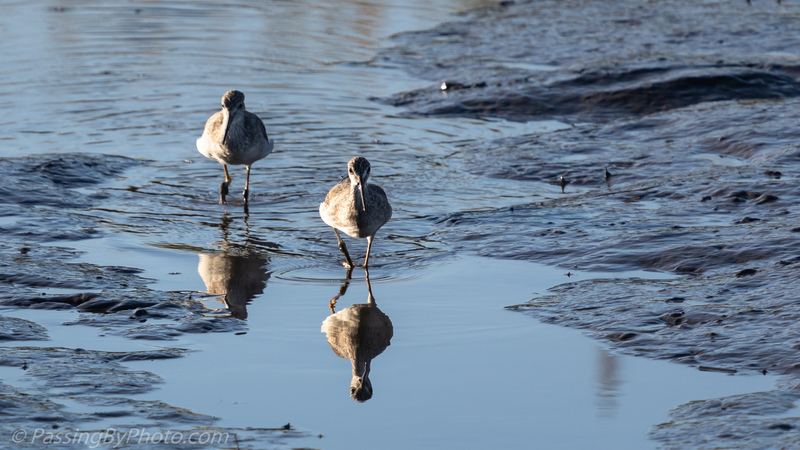 They seemed focused on something to my right; the big group was further back and to my left. The weren’t interested in joining in with the others. Perhaps they’d had their fill. 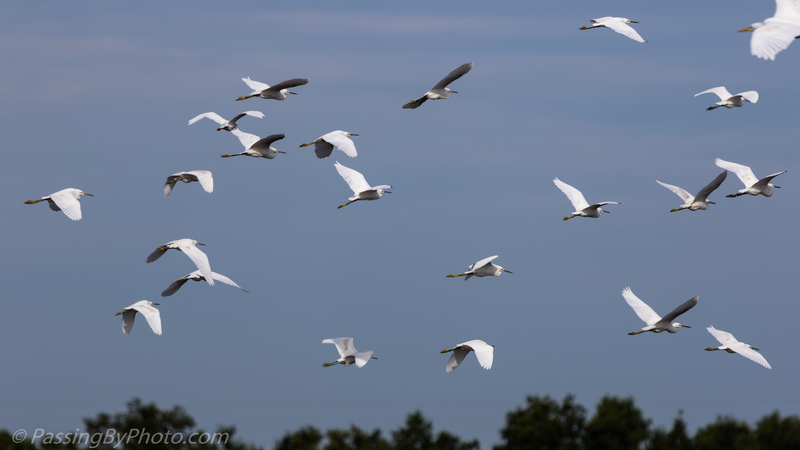 When the larger groups from the huge flock took off it was pretty noisy, mostly from the wing beats. 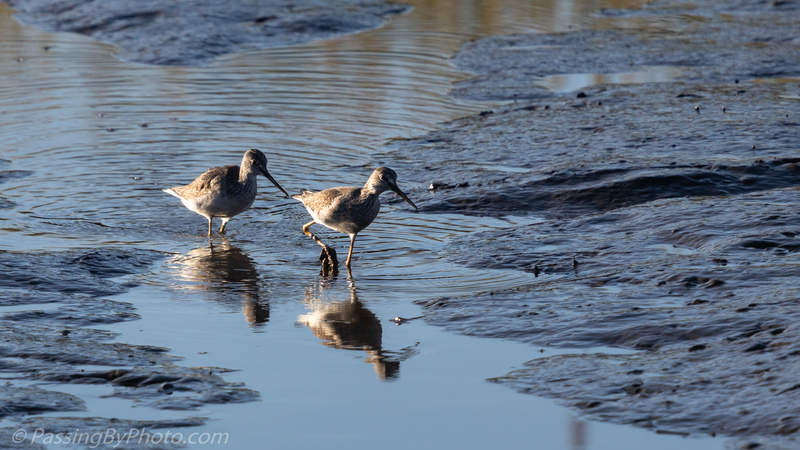 During one of those lift offs this group decided it was time to move on.